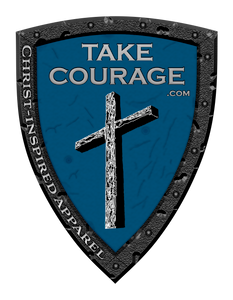 TAKE COURAGE is a small family screen printing business located just outside Phoenix, Arizona. We create and print our Christ-inspired designs in-house. Our goal is to make shirts and outerwear that are encouraging, fun and start conversations. A simple t-shirt can be an amazing platform for sharing the Gospel with someone you don't know, encouraging someone who is struggling. or perhaps holding ourselves accountable.